Ceramic Hybrid sealed bearing for 4mm shafts. Ceramic Lightning, yellow sealed bearings are specially designed for off-road or excessively dirty operating environments. These bearings are maintenance free and lubed for the life of the bearing. The heavy duty rubber seal provides extra protection against the harshest elements. 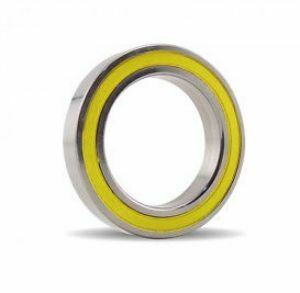 These bearings have ceramic balls, with stainless steel races and retainers. Ceramic hybrids are lighter, capable of achieving higher RPMÆs and sustaining higher operating temperatures than traditional bearings. Bearings that are packed in grease will require a short break in period to loosen up. Measurements: 4mm inside diameter x 7mm outside x 2.5mm wide. Includes: 1 Bearings per package.